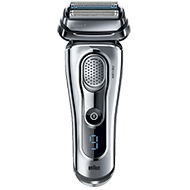 Braun is a well-known maker of men’s electric shavers. They’re a great option when looking for something not “Made in China”, as they still design and manufacturer their products in Germany. The Braun CoolTec men’s shaver has some unique features that make it stand out from other shavers in its class. 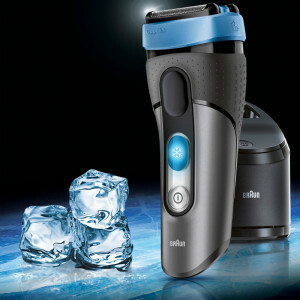 The shaver comes in a medium grey case with blue band around the top. The top of the shaver has an anti-slip grip so you won’t accidentally drop in the sink, or worse. It’s designed to be used specifically for your face or neck regions. The Braun CoolTec can be used both wet and dry. You can use water to shave with it. It’s not recommended that you use shaving gels, foams, or lotions, as they can interfere with the CoolTec function, and are incompatible with the fluid in the cleaning cartridges. If you wish to bring it into the shower with you, it’s safe to do so. The Braun shaver has been sealed, so water can’t get inside. You can rinse it under running water to get the hairs out, or use it with the cleaner. 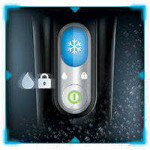 One of the best features on the Braun CoolTec is the cooling technology. If your skin ever gets warm while you’re shaving, you’ll like this great feature. 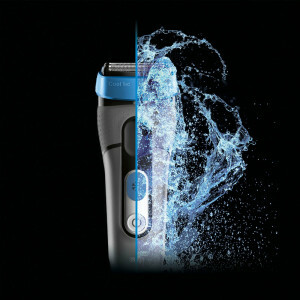 As you shave, the electric shaver will cool your skin. You’ll never have to worry about leaving the bathroom again with a red face. You’ll certainly be able to appreciate the CoolTec more during the summer time too! 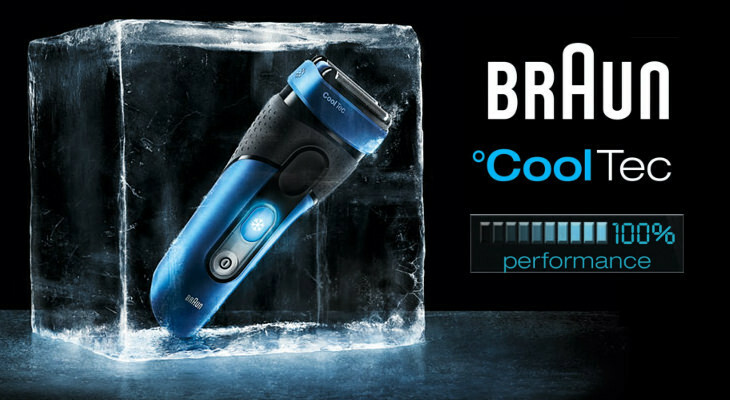 Not only will you have a cool shave, but the CoolTec technology also prevents irritation from shaving. It works by an internal cooling bar made with aluminum. It’ll condense moisture from the skin on the bar. 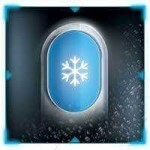 The cooling bar will minimize the warmth that occurs when shaving. It’ll minimize redness, and burning. CoolTec is an additional feature to make your skin soft and smooth after shaving. You activate the cool shave feature by pressing the button. Of course if you don’t want to use it, you can turn it off. The Braun CoolTec is not a rotary shaver, it has a traditional foil head with two moving cutting elements. 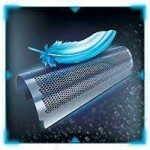 It’s made with a three stage cutting system, to ensure that all hair is removed from your face. The shaving elements move smoothly over your skin, moving with every contour and nook and cranny. Hair does not grow all in one direction. That’s why the SensoBlade technology was designed to cut off hairs, no matter in which direction they’re growing. 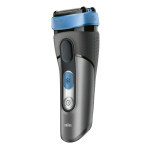 This Braun electric shaver provides a smooth clean shave. 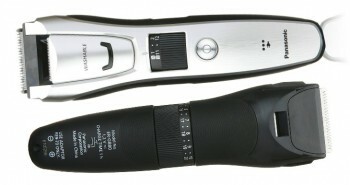 The LED display will show the status of the shaver. It’ll inform you about the charging level, or if it’s about to die down, and hygiene status, or if it’s due for a cleaning. 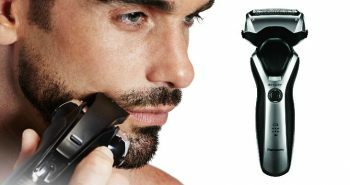 The internal rechargeable battery can be charged up in one hour, and will last about 45 minutes, or for a good 1.5 weeks worth of shaves. 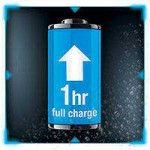 The cooling feature can be used for up to 15 minutes on one charge. 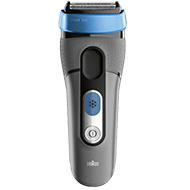 The Braun shaver also comes with a separate long hair trimmer, for touching up long beards, sideburns, and mustaches. 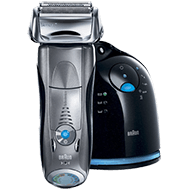 The Clean & Renew system will make the maintenance of your Braun shaver a simple process. Install the cleaning cartridge. Place your shaver in the unit and press the button. 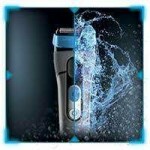 The system will automatically start the cleaning function, to hygienically clean your shaver. Your shaver will then be lubricated, to ensure all moving parts work well. After this is done it’ll charge itself up. You’ll need to ensure that you keep a good supply of cleaning cartridges handy, though the Braun can still be cleaned under running water with the enclosed cleaning brush. The cartridge packs that work with the Braun CoolTec contain alcohol, which will hygienically remove bacteria and grime from your shaver. It comes in a fresh lemon scent. If you use the cleaning function at least twice a week a brand new cleaning cartridge should be exchanged around the three month mark. 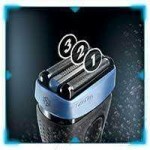 Braun recommends a few easy steps to have the best shave possible. Shave first thing in the morning, before you wash your face. Hold the shaver at right angles to your skin, or 90 degrees. Stretch your skin with one hand, while you shave against the main direction of your beard growth. You’ll find in your kit: One Braun CoolTec shaver, a cleaning and charging station, one cleaning cartridge to get you started, a charging cradle, a handy travel pouch when on the move, a smart plug and a cleaning brush. The Braun CoolTec may be a bit pricier than other electric shavers at around $140, but its exceptional features make it worth the extra cost. 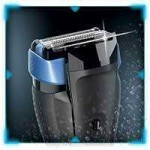 Plus, Braun is a reliable manufacturer of household products, including electric shavers.